This topic contains 31 replies, has 10 voices, and was last updated by SKT Themes 3 years, 7 months ago. I don’t have Testimonias section in my menu: Paralax-me Pro ??? Do you mean you can’t see the testimonials on the left side menu area or within the sections? I am not seeing the Testimonials section in the left side menu. I had PPM Testimonials installed, which also had a “Testimonials” item, but I have deactivated and uninstalled this add-in. The SKT Testimonials is not there. Please help. Can you email us: support@sktthemes.com with your WordPress admin details and URL of the website. We will fix this for you. is providing an admin password for a company website really the only way that you can provide support? that seems very foolish. Repeat this code: [testimonial name=”Name Here” company_url=”URL here” image_url=”http://localhost/last/wp-content/uploads/2015/02/cropped-cropped-fourteenth-image.jpg”]Your Content[/testimonial] within [testimonials][/testimonials] tag above to get carousel effect and 5-6 testimonials together. I’m agree with The previous speaker. Just write hire how to fix it ! Okay sorry about this. We are just trying to help. We are not spammers/hackers who will destroy your site. I wrote the instructions above. If those work and instructions are fine let us know. 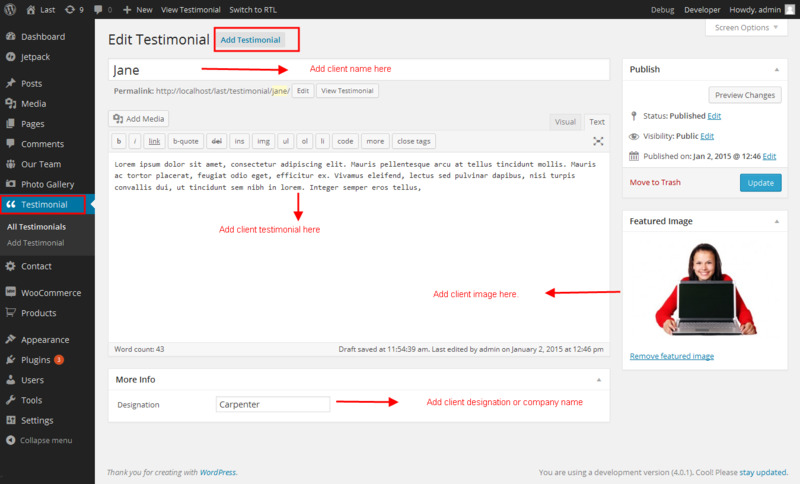 I know why sometimes there is no testimonials section in wordpress on left side menu. Testimonials and portfolio section coms with Jetpack plugin. And need to turn on in options. What is the point of having a shortcode, if I need to embed the content of the testimonials in the field? The whole point of the shortcode is to pull the data from somewhere else, like a set of posts, or something. There is some value in having a carousel, and the layout, but it doesn’t seem nearly as valuable to have to hard-code the content into the page. Will update theme today to have this like you are saying. We upgraded the theme to have testimonials from a separate post type on the left side. WOW, that is a really fast turnaround to customer feedback. I haven’t tried it yet, but I am impressed with how quickly you get back to customers! It isn’t only your UI that is responsive! 🙂 Thank you.